You ride into peril, Corin an Fol! Those are the words of the witch at the ford. Corin an Fol, mercenary, brawler, womaniser and drinker, ignores them and thus finds himself caught in a tangled web of sorcery, intrigue and dark prophesy. 'Highly recommended to Game of Thrones (fans.)' The Shattered Crown is the second novel in a sweeping new fantasy series called legends of Ansu featuring bespoke drawings by Tolkien artist, Roger Garland. When the High King is murdered and his broken crown goes missing, Queen Ariane suspects the wily hand of Caswallon the sorcerer. She forms a secret council and rides out to find the Oracle of her Goddess, to see if her worries are proved right. But Caswallon is onto her and the noose tightens fast around the young queen. Corin an Fol returns to his village seeking solace in drink. Instead he finds an old contact waiting for him who persuades him to join Queen Ariane in her fight against Caswallon. And so, like the queen, Corin an Fol is snared by the sorcerer. But he has a big sword and a bad attitude, but is that enough to survive the hordes Caswallon sends against them? 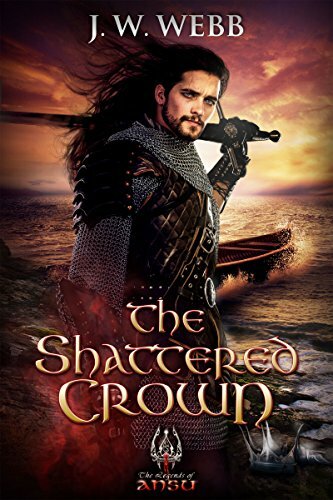 Emotionally engaging with lots of action, The Shattered Crown is set thousand years after the epic Gol. Dare you journey with Corin an Fol? The road is dark with many twists and pitfalls! I’m not sure if I should have read the first book, Gol Legend of Ansu, but I soon got into The Shattered Crown and enjoyed reading about Corin – a feisty, swearing, sarcastic, ready-for-a-fight character with a heart of gold (and probably with the added feature of having to save the world). He is a very rounded character the reader can easily relate to. The Shattered Crown (for me) is a character-driven novel, populated by unforgettable people: Ariane, a queen who can swear and fight along with any man, Caswollon the antagonist (although there were plenty of those in the book, all with serious attitude problems), Gribble the goblin who taught me some curses and far more. This book was hard to put down with action upon action in mythical scenery on a grand scale. The author has produced an epic where nothing is as it seems and has set it down in an easy-to-read way. He has created a world that is somewhere between Game of Thrones and Tolkien and will be enjoyed by those fans. This is a pure fantasy epic that leaves you wanting more and I recommend it.